Tom was featured in a TV interview in Sacramento, CA on Channel 3 - KCRA. May 26th, 2012: Well, some 11,500+ miles later my old truck and I are back home in San Luis Obispo, California again. The Johnson & Johnson big PolleNation Report trip and allergy audit of Canadian cities was quite unlike any other job I've had. For several months I was able to focus on looking at trees and shrubs in planted landscapes, always with an eye on which ones would cause allergies, and which ones would not. I am still going to finish writing up the entire report and post it here, with details on each city (Vancouver, Calgary, Edmonton, Saskatoon, Regina, Winnipeg, Toronto, Montreal, Ottawa, and Halifax). Reactine, the allergy med in Canada from J&J, will also put out a PolleNation report. That ought to be online in a few weeks. By the way: Many people have been highly surprised that Johnson and Johnson, a drug company, would hire me, the allergy-free gardening guy, to do this work. At first I was surprised myself. But J&J has a long history of doing good things, a long history of backing innovative public health programs and education. I found working with them that they were very excited to be getting this information out to the public, as they felt that indeed it could help people with allergies to better manage their symptoms. My hat is off to this progressive company! A few things from this long trip stand out: Male golden willow is planted in every city in Canada, as are male junipers. The western prairie cities have huge numbers of large male cottonwood and male aspen trees and very few females; the eastern cities have gone crazy planting male selections of honeylocust, and also have vastly over-planted the allergenic and invasive Norway maple tree. Male Manitoba maples were common in most of these cities and the female trees were far and few between. 40 years ago "pollen corridors" of elm trees used to be common, and now with DED resistant elm cultivars, these same elm pollen corridors are again becoming common in numerous Canadian cities...where they've planted nothing but these new elm trees on both sides of the block. I often also saw maple pollen corridors, where they'd planted every single tree on entire long blocks with the exact same male cultivar of hybrid (Freeman) maple. Not the best idea! In Vancouver I found many very long, very tall, huge hedges made up entirely of male yews (Taxus species). These were loaded up with pollen and were shedding abundant pollen back in March when I was there. This pollen is both allergenic... and since the plants are poisonous, the pollen is also toxic. I saw these male yews planted under windows at elementary schools, next to front doors of houses and businesses, and in many other not well thought out locations. Two cities in particular have stepped up and are going to do something about the situation. The top tree people from both Edmonton and Toronto met with me and tapped me for advice. Both of these major cities are going to start planting fewer allergenic trees, and more allergy-friendly trees. I found this very exciting, and encouraging. The one thing that was consistent in Canada, the same thing I found doing allergy audits in New Zealand and in Europe, is that the bigger the city, the more modern the city, the more the landscape and urban forest was made up of far too many male trees and shrubs, and almost no females. Since male plants shed considerable pollen and trigger allergies and asthma, and since female plants produce no pollen...this situation of "botanical sexism" appears to be far too common and is causing problems far and wide. Stay posted for more info on this blog from my Canadian allergy audit. The weather on this trip across Canada went from sunny and warm to just the opposite. 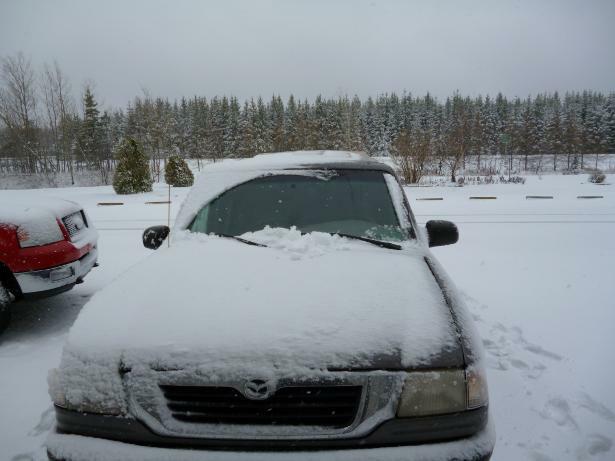 I woke up one morning on the way to Halifax and this is how my truck looked when I opened the motel door.